I’m a new Mac user (have the 2017 MacBook Pro 2.3 gHZ processor, don’t know if that matters)and I have never installed sheep shaver. I have all the files I need to have in the sheep shaver folder I launch the program but I can’t get past the grey screen with the blinking question mark. I need help or suggestions, what can I do ? I don’t know anything about computers. It seems that you did everything right up to the point that you need a disk image of an installation CD to actually boot Mac OS. -to add a disk image of an installation CD to boot from. If you don't have a disk image of an installation CD, find one on the macintosh garden site. 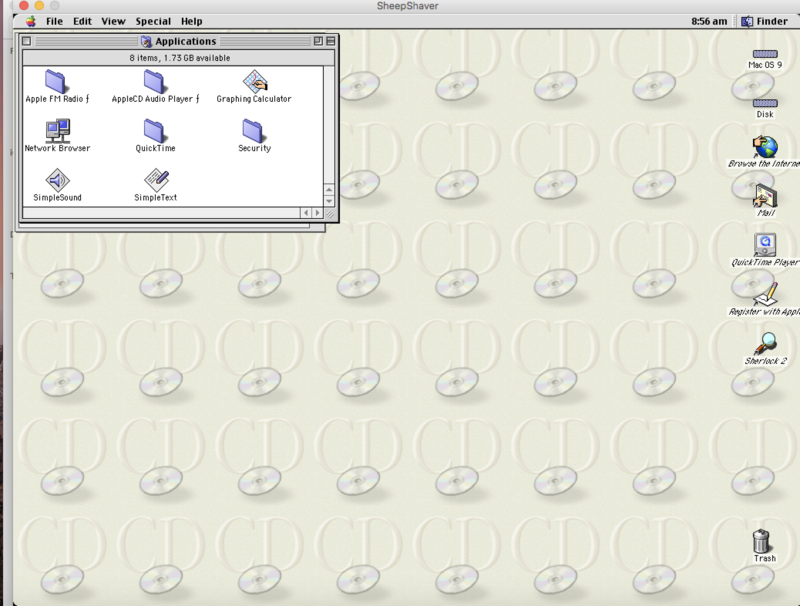 Best to search for a Mac OS 9.0.4 cd image. So I got the files from a fiend a few months ago, I can't get ahold of him, so I dicided to post my problem here. The screen shot is the files he gave me, there seems to be a Mac OS already but no file that says CD, if there anything you suggest me doing ? thanks! The image wasn't posted properly, could you upload it to a file hosting site such as Imgur and post the link in between the [img] tag? forgive all my questions, Where exactlycan I find the Macintosh garden site? The standalone prefs editor is optional, but maybe helpful. Once SheepShaver is up and running, you may set up the MacOS of your choice on a new volume. Hello all, this is what is currently in my SheepShaver file on my computer. As you seem to be using something second hand, it may help to use the standalone prefs editor. Look through all tabs of the editor and make sure the paths to your ROM etc. on your Mac are matching. Set RAM to 512 or more and add your boot device to the volumes tab. As all is set as it should, close the prefs editor. A new (hidden) prefs file is thus saved to your /users/"your name" folder. At last run the SheepShaver app. Also worth noting that based on what you've got, it's likely a stripped-down pre-installed OS 9, so you don't need to do the CD-ROM setup thing, unless you want a more capable system. Is there any suggestions, I'm new to this program and I don't know anything about computers. 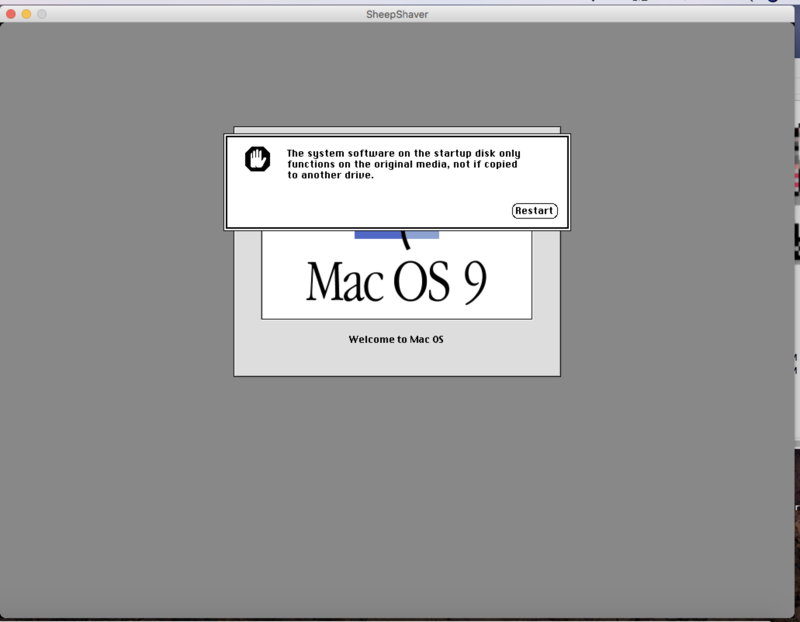 Do you suggest me downloading a whole new sheep shaver file and a new OS9.img, and MacOS ROM? Keep the "Mac OS ROM" file and trash the rest. Put the "Mac OS ROM" file in the SheepShaver folder. Put the image file in the SheepShaver folder. Currently Downloading the installation disk, is it normal to take 11+ hours? Just to be clear once it is done downloading, I will unzip the file and get the .toast image file to put into the SheepShaver folder, then I will follow the instructions on the link, right? What will I do to the rest of the installation file? Apparently you do not have a fast internet connection as I have. Did you use the Main or the Mirror link? What do you mean with "the rest of the installation file"? Keep everything in the downloaded SheepShaver folder as it is and add the Mac OS ROM file and the .toast file to the folder. I used the main link, was I supposed to use the mirror link? I will use a faster internet connection today, because the file did not download over night. I believe the mirror links are in the US and the main links are in the EU. 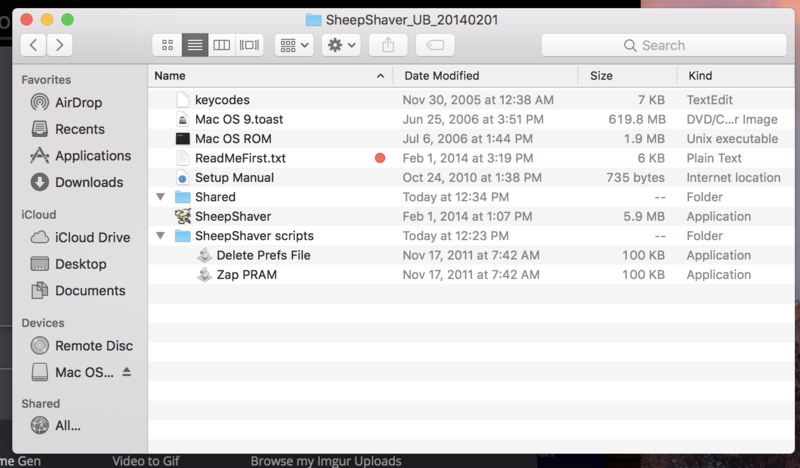 So I downloaded theMacOS904CD_Intl.ZIP (396.78 MB) Mirror, and moved it to the SheepShaver folder, but when I try to launch the SheepSHaver app it will not open. When I go into the toast file I try to install Mac OS9 but an error shows up. Any suggestions ? > when I try to launch the SheepSHaver app it will not open. When I go into the toast file I try to install Mac OS9 but an error shows up. Failure to launch means there's either something wrong with the preferences file or High Sierra's security system is preventing execution. All the files seem to be in the correct location. I'm not sure what you mean by your second sentence though... if SheepShaver failed to launch, how exactly are you "[going] into the toast file"? You can't mount it on your host operating system while running SheepShaver if you've got it listed as mounted in SheepShaver; only one place can mount it at a time. Are you able to access the Preferences menu item in SheepShaver? Do you get to the point where a blinking question mark shows up? Im sorry I am a bit confused what was I supposed to do after downloading the theMacOS904CD_Intl.ZIP (396.78 MB) Mirror and putting it into the SheepShaver folder? No I can not get to Point where the blinking question mark is, when I launch SheepShaver it closes right away. -Copy the SheepShaver program to your desktop. -Trash the SheepShaver program in your SheepShaver folder. 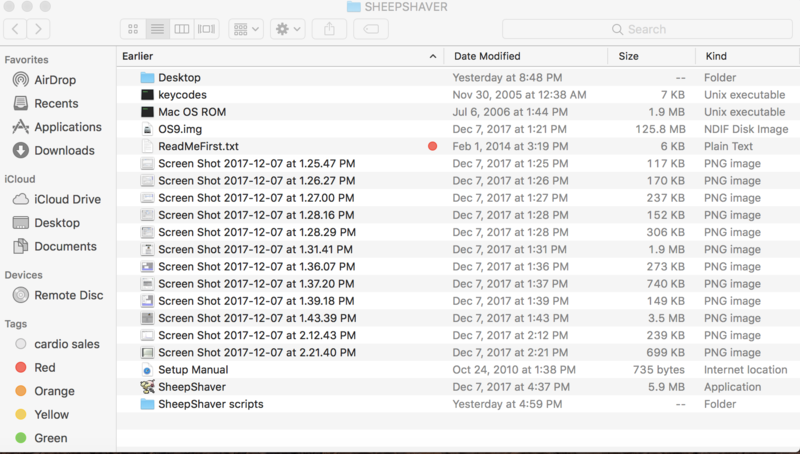 -Move the SheepShaver program copy from the desktop to your SheepShaver folder. -At the tab Setup, click Add. -Select your Mac OS 9.toast file and click Open. The Mac OS 9.toast file should now be in the Volumes list. -Click Create to create a virtual hard disk. -At Volume Size(MB) enter 2000 for a 2Gb disk. -Click Save. The virtual hard disk will be created, and added to your Volumes list. -Click Save in the Preferences editor. -Force Quit SheepShaver: Apple Menu/Force Quit, Select SheepShaver and click Force Quit. Now for the magic moment: Start SheepShaver. Please report back when you are at this point. Cat_7 I followed all the steps you provided me. I had to download the stand alone Prefs file. But I was able to get past the blinking question mark! I am now able to launch SheepShaver, but this message shows up. What do you suggest me doing now? You first have to lock the cd image file. -Choose Get info on the cd image and tick the option "Locked". -When Mac OS finds your new hard disk, it will ask you to initialise it. Give the hard disk a name and choose Mac OS Extended as format. This should get you to the desktop where you can start installing Mac OS onto the hard disk. hello all, I am now at this step (image 4) and I don't know what to do. Only the CD image should be locked. Did you by any chance also lock the hard disk image file? if so, unlock it and try again. I Have installed Mac OS , I was wondering if sheep shaver ready to use?